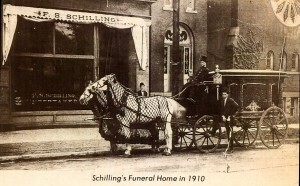 Schilling’s Funeral Home at 1301 Charleston Avenue in Mattoon dates back to 1903, when F.S. 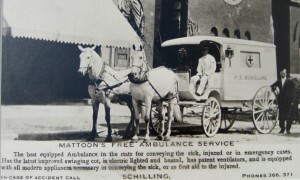 Schilling Sr. came to Mattoon from Burlington, Iowa. He bought the Valentine Schlicher business, and became associated with D.S. Campbell. The business was known as Campbell Schilling Co. Later, Schilling bought Campbell’s interest in the business, the J.D. McCarty Company, C. W. Haskell’s and the Campbell Dodds Co.
One of the first sites for the Schilling mortuary was in the Central Illinois Public Service building. The present location was remodeled in 1934, and has been their location since that time. In the early days before motorized hearses, the Schillings were very proud of their horses. They kept 58 head of horses, and had matched teams harnessed with brass and silver trimmed harness. With this number of horses, they were ready for an emergency when there was a need for ambulance service. F.S. Schilling Sr. married Della Stone of Mattoon and had one son, F.S. “Steve” Schilling Jr. After her death, Schilling married Mae Johanna Muessman of Dorans. They had one son, Joseph William. Since the death of F.S. Schilling Sr. in 1953, the business has been carried on by his two sons, who have kept the standards set by their father. In 1973 Steve Jr. retired and sold his interest to his brother, Joseph. Trained horses and fine carved hearses have long ago been replaced with the latest motorized vehicles, the funeral home has a complete sound system, air-conditioning , a complete line of funeral supplies, and all modern conveniences to give the best possible service to Schilling’s customers. Steve Schilling Jr. married Mary Loretta McCarthy of Charleston. They have one daughter, Stephanie. Steve attended Worsham Mortuary School in Chicago. At present he resides in Tucson, Arizona. Joseph Schilling attended DePauw University of Greencastle, Indiana, and the College of Mortuary Science, St. Louis, Mo. He married Elizabeth Shaw of Wichita, Kansas. They have two sons, William J. and John R. Joseph Schilling served three years in the Navy during World War II and two years in the Army during the Korean War.